I hope none of you penny pinching cheapskates found yourselves adrift in the ocean of cheap and/or dirty games during my hiatus. Mr. Lacey did some impressive work filling in on such a pivotal series but it’s high time I retake the reigns and talk about a game that features upward momentum, some antiquated rocket science and a hero that isn’t satisfied with only saving one princess. 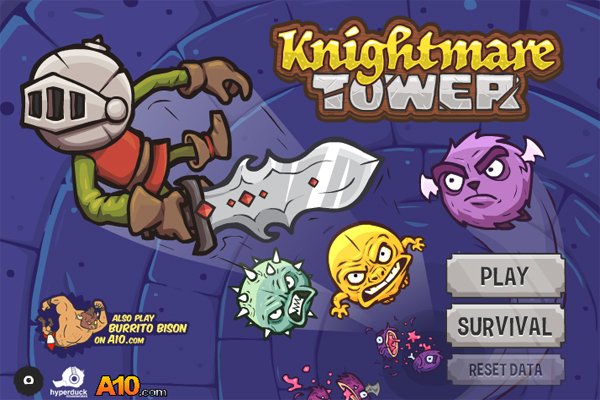 Knightmare Tower (developed by Juicy Beast Studio, creators of games like Burrito Bison and Bloom Defender) is a browser-based game that tasks you with flying through a large and hazard filled tower in the hopes of freeing ten princesses who’ve been imprisoned there by some weird looking monsters. Because the tower’s architect forgot about including stairs, our hero is forced/given the badass privilege to hop on a wooden rocket and make his way upwards NASA style. Even if it was a bad game, which it certainly is not, the premise alone would grab my attention. Pretty concise directions, I like this King guy. A wooden rocket can only go so far, however, so once your fuel is gone and your ride explodes, it’s up to you and some well placed sword slashes to keep you going. The game has a very simple control scheme in that you launch your rocket by hitting the “down” key, move with the mouse and slash with the left mouse button. Your knight stays suspended in air as long as you’re making contact with enemies. This is important because 1) the princesses are really far above you and 2) the tower is quickly filling with lava. No one said the task was going to be easy. As you soar further up the tower, the enemies become more challenging and the need for flight speed is increasingly crucial as the lava apparently gets fueled up by the rage that comes from not being able to catch you. Some of the enemies alternate between fleshy and spiked covered forms while others spit acid at you or require multiple hits to defeat. All the while they’re dropping items, gold, and the universal symbol of health (hearts). 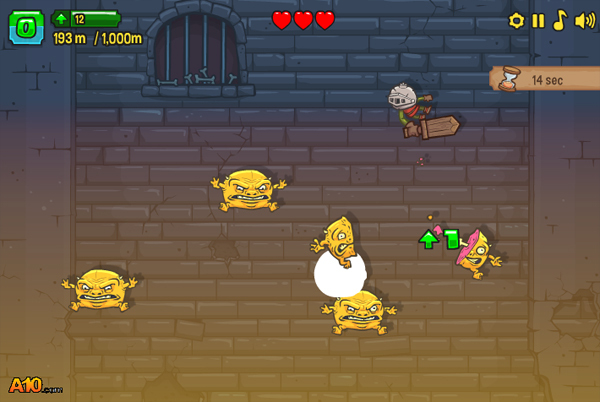 You “fail” if you lose all of your hearts through enemy attacks or plunge below the surface of the molten rock. 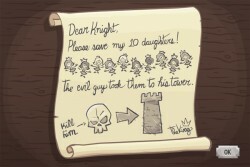 However, Knightmare Tower has a familiar mechanic in place in that you’re rewarded with gold regardless of how little progress you make through the tower in hopes that a combination of skill enhancement and better upgrades helps you achieve your objective. Those with enough gamer reflexes may not need all that the upgrade shop offers, but the whole concept does give the game a pretty low barrier of entry, which is an absolutely necessary component to browser games. It’s also the aspect of the game that is so addicting. Seriously, don’t try this at home. They don’t build towers like this anymore for a reason. I really enjoy the art style and animation of all of Juicy Beast’s games as they have a Behemoth-like quality to them, though perhaps a bit more detailed. The music is fitting yet subtle, which is a plus since you’ll be restarting from the same area multiple times and don’t want to be driven crazy by the same song. If you happen to be the type that hates slowly building, epic music you can turn it off at anytime (which is pretty standard in these types of games). If I had any advice to give the creators, I’d suggest that the sequel feature a really deep pit and the knight wearing a parachute or flying a hanglider down it. Then after that maybe a combination of the two that would allow you to go up and down the tower an infinite number of times until every sewer grate and skyscraper looks like a harrowing quest for good. You probably don’t really need to eat lunch given all the extra pounds you’ve packed on, so why not skip the food and play Knightmare Tower? It’s a game by Canadians! I love all Juicy Beast games. The last couple of them have quests (wich you forgot to mention) that give extra challenge for gold unlike just boring achivements. That’s a great point and definitely something I forgot to add. I’m curious how much time you sunk into it?